In a small dry frying pan, toast the peanuts over a medium heat until golden brown. Removed from the pan and set aside. Coarsely pound the chillies and garlic together using a pestle and mortar. Add the palm sugar, beans and tomatoes. Lightly pound to combine then squeeze in the lime juice and fish sauce. Lightly pound again, then add the green papaya and carrot. Pound again and toss to combine. The taste should be sweet and salty in perfect balance, with a sharp, sour and spicy tang. 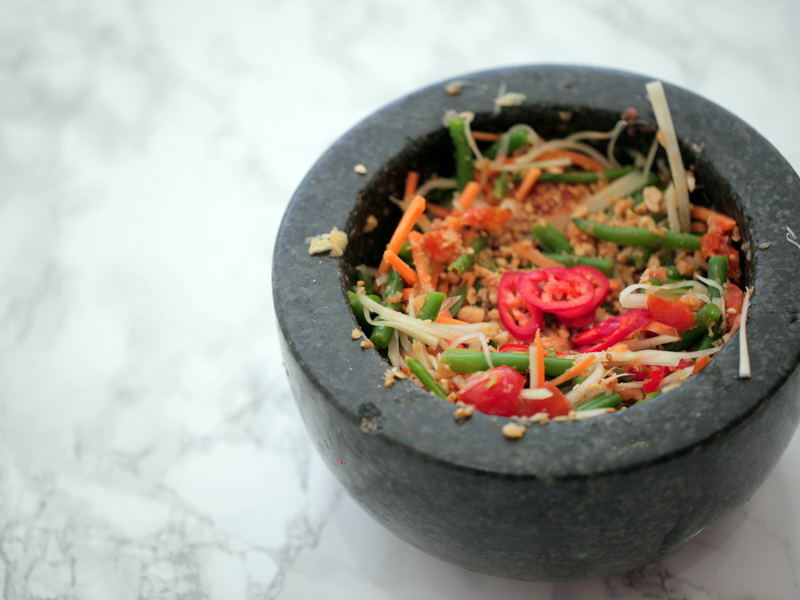 Spoon the salad into a serving bowl and sprinkle over the dried shrimp and toasted peanuts.